Jack Daniel’s Racing driver Rick Kelly says that more work lies ahead for his team as they enter the Trading Post Perth Challenge at Barbagallo Raceway in Perth, Western Australia this weekend. The 28-year-old earned Kelly Racing’s first V8 Supercars Championship win at the previous event in New Zealand and enters the Perth event second in the points standings. While Kelly believes that momentum from the win in the Saturday race in Hamilton and the pole position for Sunday’s race in NZ will help the team in Perth, he still sees more hard work ahead as he aims to cement himself in the top three in the championship. 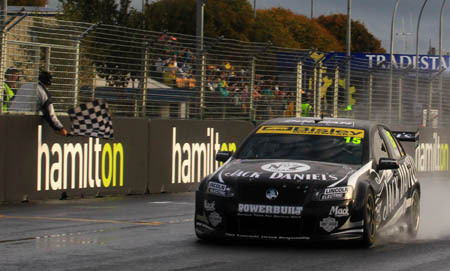 Jack Daniel’s Racing team-mate Todd Kelly was never far behind his brother in Hamilton, finishing in third place on Saturday and qualifying alongside him on the front row in second place on Sunday. Todd Kelly scored a second place finish the last time the championship visited Barbagallo Raceway in November 2009, with the elder of the Kelly brothers looking to emulate that finish in Perth this weekend as he aims to vault into the top 10 in the championship standings. “It’s great to go into Perth second in the points but every single person in our team knows that there is a huge amount of work that lies ahead,” said Rick Kelly. “The older car that we used in Hamilton is as good a chassis as we’ve got, even though the newer chassis is a little nicer in a few areas. As you could see, it handled really well all weekend painted up as my Jack Daniels’ Commodore in NZ. “It was great to drag it up the front where it belongs – now we just have to keep it there over in the West. “We are as confident as ever leading into every track now. Our cars don’t favour one type of track in particular and neither do our drivers. “The racing side of the business has definitely turned the corner,” said Rick Kelly. “That’s starting to pay off now and all the drivers and cars in the team are starting to see the rewards of that. “We’ve still got a bit of a way to go. In the dry on the soft tyre we can’t keep up with some of the other cars. We are only around fifth on pace. “We’re stoked to be in second in the championship,” said Rick Kelly. “We’ve printed out those points to enjoy but if we sneeze we are going to go back to eighth. “So that’s why it’s really critical now that we go out and get a top three or top five result in Perth to really start to cement ourselves in the top three. “That is what’s important now. Nothing else is as important as that. We’ve enjoyed the race win, we’ve walked around high fiving each other and now it’s time to turn that off and cement ourselves up there. That for us is absolutely critical. “I think winning a championship this year is a tall ask for us and where we are. But if a few other teams continue to have the year that they have had as far as up and down results go, we could win it. It’s as simple as that. We could win this championship in our third ever year and we need to focus on that with all of our energy. “The win has given me and all the guys a lot more confidence,” said Rick Kelly. “The whole race weekend in New Zealand was very tough and they did an extraordinary job in all the situations that got thrown at us. “That’s going to be really good in Perth. In saying that I don’t expect to go to Perth and beat everyone by the straight length. “I quite like the track at Perth,” said Todd Kelly. “It’s quite flowing and enjoyable to drive when you’ve got a good car underneath you. “I can’t see why our cars wont suit that place given all the improvements we’ve made to all of our cars this year. “Last time we were there it was a little like New Zealand for me – I scored my first podium for Kelly Racing on the Saturday with second, then on Sunday we just about wrote my car off. “I’m just really pumped to get over there and see where we end up given the progress we have been making and all the hard work the team has been putting in. “We have given the Lincoln Welders a bit of a hiding over the past few events from making repairs to cars and welding everything back together. “There was quite a lot of damage to my #7 Jack Daniel’s Commodore after Hamilton and it was a very hard hit in the driver’s side.